For four days a man had been presumed dead. A miraculous healer arrived to tell his friends and family that this was not the end. It was hard for them to imagine. Yet, his tombstone was removed and there he stood alive. So many threads run through the Lazarus parable. Themes of faith and hope. Themes of believing in the face of seemingly impossible circumstances. Themes of rising from quietus. And themes of porousness – the porousness between life and death, and the porousness of time. All of these strands come together in Lazarus, choreographed in 2018 by Rennie Harris for Alvin Ailey American Dance Theater. The two-act work, which Artistic Director Robert Battle shared in his opening remarks was a first for the company, takes its audience on a journey. A journey through the African American experience, a journey through history and a journey through space and time. 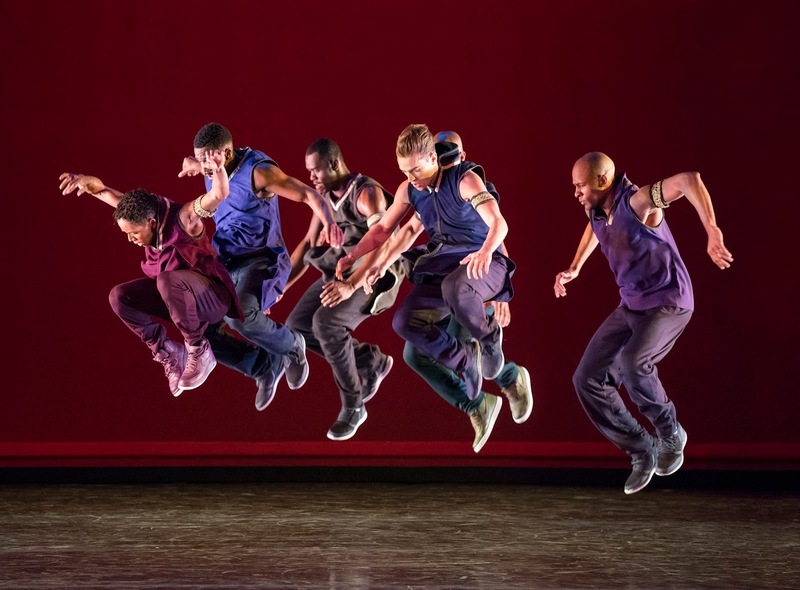 Within these larger narratives, Harris also weaves tributes and remembrances to both to Alvin Ailey and to AAADT on the occasion of their sixtieth anniversary. This gripping work saw its Bay Area premiere Tuesday night as the troupe opened its annual weeklong residency at Cal Performances (Lazarus was also co-commissioned by Cal Performances). Lazarus doesn’t seek to be a literal rendering of the biblical story. Instead, it applies the broader themes to three different eras, and unpacks them through movement and scenework. First Harris takes the viewer back in time, to the horrors of slavery. Potent, disturbing images of forced labor, human cruelty, even lynching, pervade the stage: dancers trudged through the space, heads down, arms drilling toward the ground. Mouths contorted in silent screams; hands shook, desperately praying for justice; torsos wailed in grief. Several phrases saw the cast running full speed away from something terrifying. Yet, amidst all that terror, Harris also injected glimpses of hope. A deep sense of community underscored this entire first scene, as did a recurring physical motif. Dancers would traverse the stage with suspended, slow motion strides coupled with expectant, lifted gazes and longing expressions. These vast lunges weren’t running out of extreme fear, they were all about moving forward, toward something or someone. I couldn’t specifically say what that thing or person was, though the tone undeniably spoke of resilience, of rising like Lazarus. The connection to the source material was far from over as Lazarus shifted into its next chapter – the mid-twentieth century. As the first act came to its close, what struck was the porousness of time. Lazarus had indeed morphed to a different era, no question. Plain, rural clothing had been replaced with costume designer Mark Eric’s take on 1960s stylings. And Harris added a more sinewy expression of the upper body to the traditional African percussive footwork. Though much (good and bad) was the same, despite the time lapse. The feeling of community was still unmistakable. But so was the violence and bloodshed. Bodies flung and crumbled all over the space, as if hit by gunfire. After intermission, Act II of Lazarus once again took us to a new place and time. Jeweled-toned tunics, trimmed with gold had a definite 1980s vibe and the high-throttle, pulsing, free choreography added a note of celebration. 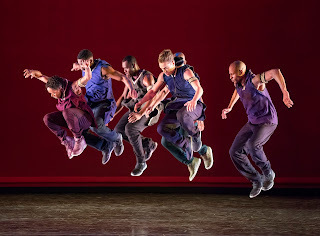 This felt like heaven, maybe even the heaven that welcomed Mr. Ailey after he passed from this world in 1989. But at the same time, you couldn’t be sure it was heaven. As the lights fell on Lazarus, that line between life and afterlife had been left purposely uncertain. Lazarus is a powerful performance work that fires on all cylinders – design, music, movement and narrative. 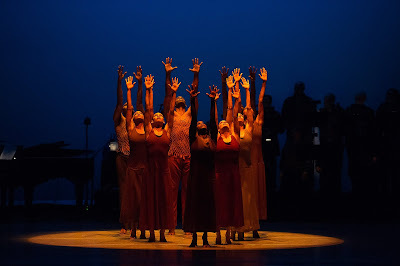 And it was brilliantly interpreted by the entire Ailey company. Though the piece’s formal structure did spark a question. The dance clearly has three parts to it, but is divided into two acts. The middle section (tacked onto the end of Act I) felt a little rushed and less developed than the other two segments. I wonder what Lazarus would look like as a three-part ballet, with an expanded middle section and one act dedicated to each separate scene. And of course, the evening closed with Ailey’s 1960 masterwork Revelations. As with so many, I never tire of seeing this transcendent dance suite. Highlights at this viewing included the unison port de bras and port de corps during I Been ‘Buked and the urgent yearning that Jacqueline Green and Jamar Roberts brought to the spellbinding Fix Me, Jesus pas de deux.